Copyright © 2013 Sachiko Takikawa et al. This is an open access article distributed under the Creative Commons Attribution License, which permits unrestricted use, distribution, and reproduction in any medium, provided the original work is properly cited. While paralysis is widely appreciated to impact the quality-of-life after spinal cord injuries (SCIs), neuropathic chronic pain may also occur in many cases. In this study, we investigated whether human umbilical cord-derived mesenchymal stromal cells (hUCMSCs) possess the therapeutic potential to reduce neuropathic pain following SCI in rats. Spinal cord hemitransection, which was used as a rat SCI pain model, induced tactile hypersensitivity in the hind paw and hyperexcitability of wild dynamic range neurons in response to natural cutaneous stimuli. Following hemitransection, we transplanted hUCMSCs into the spinal cord. Attenuation of neuronal hyperexcitability was observed in the hUCMSCtreated group compared with that observed in the vehicle-treated group. Immunohistochemistry showed that the transplanted hUCMSCs retained the expression of gammaamino butyric acid (GABA). The results suggest that transplanted hUCMSCs ameliorate GABAergic inhibition in the spinal cord. In summary, the production of GABA plays a critical role in the plasticity of neuropathic pain after implantation of hUCMSCs. Spinal cord injuries (SCIs) result in a severe impairment of the motor and sensory function below the level of the lesion. Stem cell therapy is a potential treatment for SCI, and the therapeutic benefits of a variety of different stem cell types have been evaluated in animal models and humans with SCI. The cellular sources of stem cells include human embryonic stem cells, induced pluripotent stem cells, fetal neural stem cells, adult bone marrow-derived mesenchymal stem cells (hBMMSCs) and dental pulp-derived stem cells [1-5] . It has been shown that the umbilical cord matrix (the Wharton’s Jelly surrounding the umbilical vessels) contains a great number of fibroblastoid mesenchymal cells that have been characterized as exhibiting the properties of selfrenewal and multipotent differentiation  . Recently, one group found that umbilical cord-derived mesenchymal stromal cells (hUCMSCs) can be induced to differentiate into neuron-like cells in vitro  , while transplantation of hUCMSCs achieves improvement of the motor function in SCI animal models  . We have also reported remarkable benefits of hUCMSCs in wound treatment . In many cases, SCIs are also accompanied by chronic pain syndrome, including allodynia (pain elicited by normally non-painful stimulation) and hyperalgesia (exaggerated pain evoked by noxious stimulation) . Previous studies provide evidence that cell transplantation strategies that allow a long-term supply of gamma-aminobutyric acid (GABA) are a useful means of treating pain following injury to the peripheral and central nervous system [10,11] . We focused on the neural stem-like characteristics of hUCMSCs, in particular, the expressions of basic herix-loop-herix (bHLH) transcription factors known to function during mammalian neurogenesis. HES/HEY-like transcription factor (Helt) is coexpressed with achaete-scute complex homolog 1 (Ascl1, also known as Mash1) in brain regions that give rise to GABAergic neurons [12,13] . In addition, pancreas transcription factor 1 subunit alpha (Ptf1a) has been found to be involved in driving neural precursors to differentiate into GABAergic neurons in the cerebellum and the dorsal horn of the spinal cord  . In the present study, we attempted to investigate the characteristics of hUCMSCs as GABAergic neurons for the treatment of SCI-induced neuropathic pain. Hucmscs, which combine several advantages of fetal stem cells and adult stem cells, have been proposed to be an appropriate source of self-renewal with a high growth rate and multipotent differentiation properties for transplantation [6,15] . We transplanted hUCMSCs into the spinal cordto examine the effects of implanted cells. After transplantation, we examined behavioral tests to investigate whether SCI-induced hypersensitivity is attenuated. Thereafter, a histological analysis was performed to confirm the survival of engrafted hUCMSCs in lesions. We investigated the characteristics of hUCMSCs in vitro, in particular, with respect to differences from hBMMSCs, and found that hUCMSCs possess the potential for GABA production. Human umbilical cords were obtained from Nagoya University Hospital after full-term elective Caesarian sections. hUCMSCs were extracted as previously described [8,16,17] . The umbilical vein was pulled away with the surrounding tissue and placed into low-glucose Dulbecco’s modified Eagle medium (DMEM-LG; Life Technologies, Carlsbad, CA) containing 0.075% collagenase type II (Sigma, St. Louis, MO) and 1 mM of Lglutamine (Life Technologies) with 100 U/mL of penicillin, 0.1 mg/mL of streptomycin and 0.25 μg/mL of amphotericin B. After performing enzymatic dissociation for six hours at 37˚C, the centrifuged cell pellets were suspended in DMEM culture medium supplemented with 10% fetal bovine serum (FBS; Life Technologies) and 1 mM of L-glutamine. The cells and medium were seeded into 6-well plates (Becton, Dickinson and Company, Franklin Lakes, NJ) at a density of 10,000 cells/cm2 and maintained in a cell incubator (37˚C, 5% CO2, 1% O2 and 90% humidity). When the cells reached 80% confluence in approximately 4 - 5 days, the monolayers were split at a ratio of 1:3 using trypsin-EDTA (TryLE Express, Life Technologies). In this study, cells of passage two to five were used. For the immunocytochemical procedure, hUCMSCs of passage three were permeabilized with 0.1% Triton X-100 in PBS. After a subsequent rinse with PBS, the cells were blocked with 1% FBS in PBS and incubated for two hours with the primary antibodies: anti-nestin (mouse, 1:1000; Becton, Dickinson and Company), antiglial fibrillary acidic protein (GFAP; mouse, 1:500; Cell Signaling Technology, Inc, Danvers, MA), antidoublecortin (goat, 1:500, Becton, Dickinson and Company), anti-neuronal nuclei (NeuN; mouse, 1:500, Becton, Dickinson and Company), anti-neuron-specific class III β-tubulin (Tuj-1; rabbit, 1:500; Millipore Corporation, Billerica, MA), anti-CNPase (mouse, 1:500; Cell Signaling Technology, Inc.) or anti-CD11b-FITC-conjugated (mouse, 1:500; Becton, Dickinson and Company). Following two rinses in PBS, unconjugated markers were reacted for one hour with secondary antibodies: Alexa Fluor 488 goat anti-mouse IgG (Life Technologies), Alexa Fluor 488 goat anti-rabbit IgG (Life Technologies) or PE rabbit anti-goat IgG (Abcam, Kenbridge, UK). A total of 10,000 labeled cells were analyzed using a FACS Calibur flow cytometer (Becton, Dickinson and Company). For the suspension culture, dissociated hUCMSCs were placed on ultra low-attachment culture dishes (Corning, Tewksbury, MA) at a concentration of 2 × 105 cells/cm2 at 37˚C in 5% CO2 and 1% O2. This sphere formation procedure was modified from the method of the sphere assay protocol [17,18] . The protocols were as follows: hUCMSCs were treated in serum-free DMEM supplemented with 20 ng/mL of epidermal growth factor (EGF; Pepro-Tech, Rocky Hill, NJ), 20 ng/mL of basic fibroblast growth factor (FGF-2; Pepro-Tech), 20 mM of GlutaMAX (Life Technologies) and an N2 supplement (1:100, Life Technologies). After 48 hours, sphere formation was observed. Total RNA from hBMMSCs (Lonza, Basal, Switzerland) and hUCMSCs was extracted using the RNeasy Mini Kit (QIAGEN GmbH, Hilden, Germany). The total RNA yield was determined using the NanoDropTM 1000 (Thermo Fisher Scientific Inc, Waltham, MA), and the RNA integrity was evaluated and used for subsequent experiments only if the A260/A280 ratio exceeded 1.8. An RT reaction with 1 µg of total RNA was carried out using a first-strand cDNA synthesis kit (ReverTra Ace α; Toyobo Co. Ltd. Osaka, Japan). Thereafter, qualitative PCR was performed by mixing 1 µg of cDNA and 10 µM of specific primers at 94˚C for two minutes, followed by 35 cycles of 94˚C/15 sec, 60˚C/30 sec and 72˚C/60 sec, with a final extension of 72˚C/10 min. Quantitative real-time PCR was performed in 96-well 0.2-mL thin-wall PCR plates using the Thermal Cycler Dice (Takara Bio Inc., Tokyo, Japan) and SYBR Premix Ex Taq II (Takara Bio). The real-time PCR mixture contained 2 × SYBR Premix Ex Taq II, 10 µM of specific primers and 100 ng of cDNA in a total volume of 25 µL. The PCR profile included an initial incubation at 95˚C/10 sec, then 40 cycles of 95˚C/5 sec and 60˚C/30 sec followed by dissociation at 95˚C/15 sec, 60˚C/30 sec and 95˚C/15 sec. The primer pairs used in this study are listed in Table 1. Eight-week-old Female Sprague-Dawley rats (250 - 300 g body weight) were obtained from the Animal Center of Chubu Kagaku Shizai, Japan. All animal procedures were performed under protocols that conformed to the National Institutes of Health Guidelines. For different treatments, the rats were divided into three experimental groups: 1) the hUCMSC-treated hemitransection group (n = 8), 2) the PBS-treated hemitransection group (n = 8) and 3) the Sham (control) group (n = 5). The animals were anesthetized with sodium pentobarbital (3 mg/100 g). After performing laminectomy at the 7 - 9th thoracic vertebral levels, the dura was opened and the spinal cord (T9-T10) was left-half transected using a surgical blade and a 27-gauge needle. Before administration, we triturated hUCMSC-spheres into single cell suspension. Immediately following hemitransection, 10 µl of PBS containing 1 × 106 hUCMSCs was implanted into the severed spinal cord using a 10-µl Hamilton syringe (Hamilton, Reno, NV) with an automatic microinjection pump (model KDS-310; Muromachi Kikai Co. Tokyo, Japan). The cells were deposited into three injection sites at the ipsilateral side of the rostral and caudal stumps, 2 mm from the lesion and 1 mm lateral to the midline at a depth of 1 mm. 6 µl of fibrin glue was injected into the gap to fill the lesion site in the severed spinal cord. For the control groups, only 10 µl of PBS was injected. All animals received daily cyclosporine A at a dose of 10 mg/kg for eight weeks after transplantation. Table 1. List of PCR primers used in the present study. For the studies of thermal nociception, a tail-immersiontest was used in which the last 3.5 cm of the tail was dipped into a water bath at 55˚C and the latency to flutter the tail was taken as the end-point. The maximal latency allowed was 15 seconds to avoid potential tissue damage. The left hind paw withdrawal threshold was determined using von Frey filaments and was expressed in grams. Seven filaments ranging from 4.0 to 60.0 g were used. The protocol used in this study was a variation of that described by Pitcher et al.  . A series of von Frey filaments was applied from below the wire mesh to the plantar surface of the left hind paw in ascending order beginning with the lowest filament (4.0 g). A trial consisted of the application of a von Frey filament to the hind paw five times at 5 second intervals or as soon as the hind paw was placed appropriately on the platform. When the hind paw was withdrawn from a particular hair either four or five times out of the five applications, the value of that hair in grams was considered to be the withdrawal threshold. The procedure used in this study was modified from the method described by Zhang et al  . The animals were sacrificed and fixed transcardially with ice-cold PBS and 4% paraformaldehyde. 20-mm transverse segments of the SCI lesions were dissected and stored in the same fixative overnight. The tissue specimens were frozen and cryosectioned as 20-µm thick longitudinal sections of the transected sites via a cryomicrotome (Microcom/ HM500V, Walldorf, Germany). Individual sections were immunostained overnight with primary antibodies: anti-glutamate decarboxylase (GAD) 65 (rabbit, 1:50; abcam, Cambridge, UK), anti-human nuclei (HuN; mouse. 1:250; Millipore), anti-NeuN (1:500), antiGFAP (1:500) or anti-CNPase (1:500). The sections were then incubated with secondary antibodies for one hour, washed and mounted on glass slides with fluorescent mounting medium (Vectorshield, Vector Laboratories, Burlingame, CA). The samples were examined using a fluorescent microscope (Leica Microsystems, Wetzlar, Germany) and an IM50 imaging system. The Nagoya University Ethical Committee approved this study, and all participants gave their written informed consent. The animal research protocol was approved by the Nagoya University Institutional Animal Care and Use Committee (IACUC Protocol 21352). All surgeries were performed under anesthesia, and all efforts were made to minimize suffering. Figure 1. Flow cytometric histograms of hUCMSCs. hUCMSCs of passage three were stained with antibodies specific to neural stem cell markers and markers that characterize neuronal and glial cells and precursors. The cell debris was gated-out and histogram charts were plotted. Nestin: 64.6%, GFAP: 72.1%, doublecortin: 34.0%, NeuN: 1.04%, CNPase: 60.0% and Tuj-1: 73.1%. and progenitor cells at different lineage commitment stages. To investigate the potential effects of forming floating colonies, we cultured hUCMSCs in suspension with EGF and FGF on ultra low-attachment culture dishes. After 48 hours, aggregated hUCMSCs were collected. To determine whether the hUCMSC spheres increased neurogenesis, quantitative real-time PCR was performed to confirm the changes in the expressions of genes that have been implicated in neural stem cell transcription factors. As shown in Figure 2, Sox2 and NeuroD1 in plate cultured hUCMSCs were expressed at similar levels as those observed in hBMMSCs. However, the expression levels of hUCMSCs were increased in sphere formation. 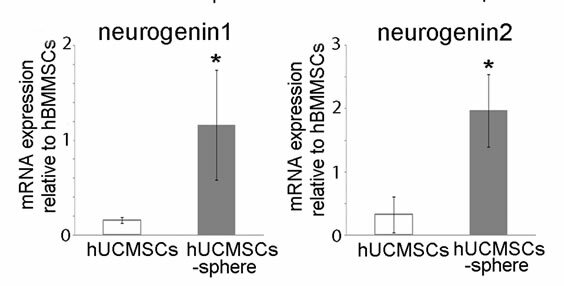 In addition, neurogenin 1 and neurogenin 2 in the hUCMSC spheres were expressed at higher levels in comparison with those observed in hBMMSCs, whereas the expressions in hUCMSCs were very low. Figure 2. Effects of sphere formation of hUCMSCs on the Sox2, NeuroD1, neurogenin 1 and neurohenin 2 gene expression. The values are expressed as the mean ± SD relative to the internal control housekeeping gene GAPDH. As compared with hBMMSCs, the hUCMSCs exhibited 1.3-((A): Sox2), 1.1-((B): NeuroD1), 0.18-((C): neurogenin 1) and 0.12 ((D): neurogenin 2)-fold expressions. After performing a suspension culture, the hUCMSC spheres exhibited 2.5-((A): Sox2), 2.8-((B): NeuroD1), 1.2- ((C): neruogenin 1) and 2.0 ((D): neurogenin 2)-fold expressions. Student’s t-test was performed to detect significant alterations in the gene expression, where *, p < 0.05. Single cell suspensions of hUCMSC spheres weretransplanted into hemitransected spinal cords (Figure 3(A)). The tail dip test and the von Frey test were performed to demonstrate improvements in sensory hypersensitivity against thermal and mechanical stimulation in the sham operation group (control), the hUCMSC-sphere transplantation group and the PBS-treated hemitransection group. In Figure 3(B), prolongation of latency was observed from two weeks after transplantation onward. A similar trend was observed in the von Frey test (Figure 3(C)). These results suggest that hUCMSC transplantation significantly affects recovery from hypersensitivity. Figure 3. Sensory recovery after transplantation of hUCMSCs. (A) Experimental design for cell grafting after hemitransection of the spinal cord at the Th 9 - 10th level. (B) Tail immersion test: the latency to flick the tail after immersion in a 55˚C water bath for the assessment of thermal hypersensitivity. The results are expressed as the mean ± SEM. The hUCMSCs group exhibited elongation of latency after two weeks post-transplantation. One-way ANOVA with the HolmSidak Test was used to analyze the differences in the lstency, where *, p < 0.05 between the PBS group and the hUC-MSC group. (C) von Frey test: the tactile sensitivity threshold of the ipsilateral hind paw of SCI for the assessment of mechanical hypersensitivity. The hUCMSCs group exhibited elevation of the threshold after two weeks post-transplantation. The results are expressed as the mean ± SEM. One-way ANOVA with the Holm-Sidak Test was used to analyze the differences in the threshold, where *, p< 0.05 between the PBS group and the hUC-MSC group. differentiate into neurons (data not shown). The majority of HuN-positive hUCMSCs expressed GAD65, suggesting that these cells remained undifferentiated (Figure 4(A)). A few HuN-positive grafted cells in the hUCMSCs group survived in the hemitransected spinal cords. Most of the surviving cells were located at the periphery of the lesion site next to unaffected tissue. 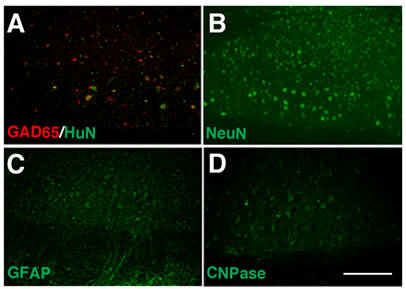 At the rostral and caudal stumps of the injured epicenter, surviving neural and glial cells were labeled with anti-NeuN, GFAP and CNPase antibodies in the hUCMSCs group (Figures 4(B)-(D)). On the other hand, there were few surviving cells in the PBS-treated hemitransection group, and imnmunostaining showed negligible signals (data not shown). The percentage of HuNpositive neural-like cells was small; however, many neural cells remained in the hUCMSCs group. Figure 4. Engraftment of GAD-positive hUCMSCs and neuroprotection around the lesion site with hUCMSC transplantation. Eight weeks after transplantation, a pathological analysis was performed. Most of the surviving HuN-positive hUCMSCs (green; (A)) were double-labeled with anti-GAD65 antibodies (red; (A)), whereas there were few GAD-positive cells in the PBS group (data not shown). In the hUCMSCs group (B)-(D), a few neural and glial cells survived. The scale bar indicates 100 μm in (D). that functions in the biosynthesis of GABA. Approximately 80% of the hUCMSCs were positive for GAD65 immunostaining (Figure 5(B)), which was a higher rate than that observed for hBMMSCs (Figure 5(C)). As shown in Figure 5(D), semiquantitative RT-PCR analyses also revealed that hUCMSCs express a high level of GAD65. 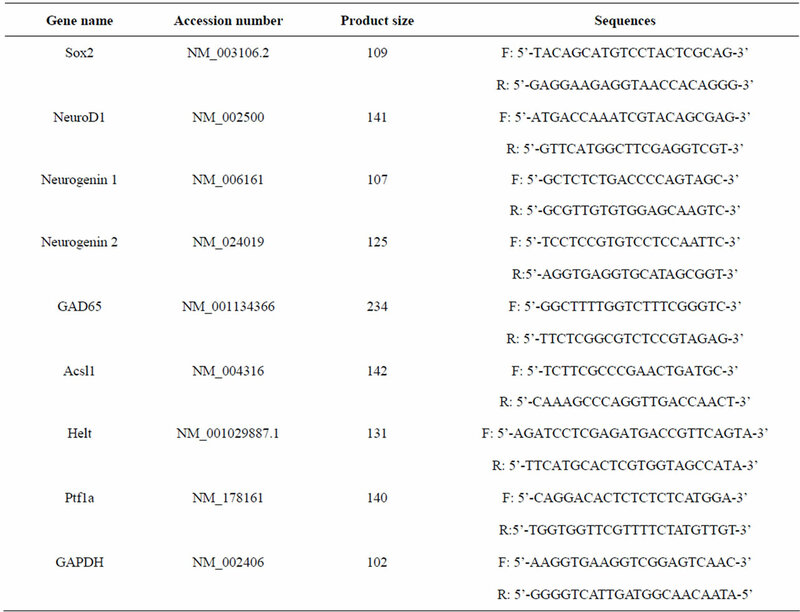 Figures 5(E)-(G) present the quantitative realtime RT-PCR results for genes involved in GABA ergic neuron differentiation in vivo, including Ascl1, Helt and Ptf1a. In the hUCMSCs, the gene expressions of Ascl1, Helt and Ptf1a exhibited 4.8-, 5.4-and 3.2-fold increases compared with those observed in the hBMMSCs, respectively. Figure 5. Expression of GAD65 in hUCMSCs. (A) The concentrations of dopamine, adrenaline, noradrenalin and GABA in the culture media of hUCMSCs and hBMMSCs were measured using high performance liquid chromatography. The hUCMSCs of passage three (B) and hBMMSCs (C) were stained with anti-GAD65 antibodies. Approximately 80% of the hUCMSCs expressed GAD65, while only 30% of the hBMMSCs expressed GAD65. (D) An RT-PCR analysis showed an enhanced expression of GAD65 in the hUCMSCs compared with that observed in the hBMMSCs. (E)-(G) A quantitative real-time PCR analysis demonstrated the expressions of markers involved in GABA synthesis (Ascl1, Helt and Ptf1a). Student’s t-test was performed to detect significant alterations in the gene expression, where *, p < 0.05. In this study using an animal model of SCI, we focused on determining whether transplantation of hUCMSCs as GABAergic neurons effectively reduces pain-like responses induced by SCI in order to verify the possibility of cell replacement therapy using hUCMSCs for the treatment of SCI-induced neuropathic pain. hUCMSCs can provide a potentially unlimited supply of GABA following grafting intraspinal administration as a practical cell based-therapy. In previous studies, cell-based therapies for neuropathic pain that deposited GABAergic cells onto the subarachnoid space  or into the spinal cord  produced reductions in mechanical allodynia within one week post-transplantation. The present study shows that transplantation of hUCMSCs directly into the spinal cord improves hypersensitivity against tactile and thermal stimulation within two weeks after transplantation, with a peak reduction in allodynia observed at four weeks that persisted even eight weeks following transplantation. There is some evidence indicating that the spinal GABAergic system plays a critical role in the development and maintenance of chronic pain states following injury of the central and peripheral nerves  . The increased expression of P2X4 receptors, which are induced in hyperactive microglia after nerve injury, promotes GABA-induced membrane depolarization at sensory terminals [24,25] . In our study, infiltration of activated microglia was suppressed 72 hours after hUCMSC transplantation. This decrease in inflammation might be caused by the neuroprotective effects of surviving hUCMSCs on spinal cord inhibitory interneurons. GABA-mediated neuroprotective effects have been demonstrated in various animal models of ischemia . In the present study, the PBS group exhibited more obvious apoptosis and demyelination in peri-injured areas compared with the hUCMSCs group. We found that hUCMSCs prevented myelin and neural cell apoptosis and further improved the motor and sensory functions. Recently, the paracrine effects of MSC have been emphasized. It has been reported that MSCs provide protection via paracrine mechanisms involving the release of a wide array of cytokines (such as vascular endothelial growth factor, hepatocyte growth factor and insulin-like growth factor-1) that exert their effects on surrounding cells [27,28] . Other studies have hypothesized that trophic factors secreted by transplanted cells contribute to behavioral improvement by protecting or limiting the death of cells affected by endogenous cord injury [29,30] . Neural stem and precursor cells have also been shown to secrete trophic factors that regulate the fate determination of neighboring cells [31,32] . The underlying reasons may be that surviving hUCMSCs secrete cytokines, while paracrine effects may contribute to profound antiapoptotic potency and reduction of injury. We herein demonstrated improvement of neuropathic pain following transplantation of hUCMSCs. The underlying mechanism is thought to involve hUCMSCs that act as GABAergic cells and play neurotrophic and neuroprotective roles. Although this effect may be related to the GABAergic effects of restoration of GABA immunoreactivity in the spinal cord, it is also thought to be related to the secretion of non-GABAergic substances. The use of a transplantation strategy may be necessary to achieve more complete amelioration of nociception that occurs using neurotransmitter systems in addition to GABA. Our data suggest that the use of intraspinal transplantation of hUCMSCs as GABAergic cells is a novel strategy to attenuate the pain induced by SCI. The use of cellbased therapies will require further investigation to ensure that the behavioral effects are persistent and without adverse effects over the long term. The development of transplantation strategies to relieve SCI-induced pain will increase the possibility of the therapeutic application of hUCMSCs, as well as ES and iPS cells. Ronaghi, M., Erceg, S., Moreno-Manzano, V. and Stojkovic, M. (2010) Challenges of stem cell therapy for spinal cord injury: Human embryonic stem cells, endogenous neural stem cells, or induced pluripotent stem cells? Stem Cells, 28, 93-99. Sakai, K., Yamamoto, A., Matsubara, K., Nakamura, S., Naruse, M., et al. (2012) Human dental pulp-derived stem cells promote locomotor recovery after complete transection of the rat spinal cord by multiple neuro-regenerative mechanisms. Journal of Clinical Investigation, 122, 80-90. Fode, C., Ma, Q., Casarosa, S., Ang, S.L., Anderson, D.J., et al. (2000) A role for neural determination genes in specifying the dorsoventral identity of telencephalic neurons. Genes & Development, 14, 67-80. Weiss, S., Dunne, C., Hewson, J., Wohl, C., Wheatley, M., et al. (1996) Multipotent CNS stem cells are present in the adult mammalian spinal cord and ventricular neuroaxis. The Journal of Neuroscience, 16, 7599-7609. Eaton, M.J., Plunkett, J.A., Martinez, M.A., Lopez, T., Karmally, S., et al. (1999) Transplants of neuronal cells bioengineered to synthesize GABA alleviate chronic neuropathic pain. Cell Transplant, 8, 87-101.